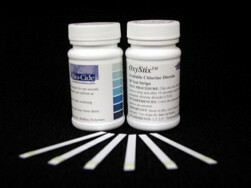 Chlorine Dioxide Test Strips - OxyStix™ test strips are used to check the concentration of available CLO2 in water treated with Purogene. Just dip the pad of the strip into the water to be tested and read the amount of available CLO2 by comparing the color to the scale on the label. Reads from 0-100 PPM. Standard CLO2 test strips will NOT work to check water treated with Purogene. OxyStix™ are the only test strips that will work with Purogene. Strips have a shelf life of about 18 months. Select the qty of test strips below. Quantity is the number of test strips you will receive in the package. Price does not include shipping. Shipping to 50 states is $1 to $3.75.